The school I work at is in its second week of the year, things are held together with Sellotape and bailing wire and just about functional, so of course I spent most of my morning dodging in and out of the new module sites for TM129 and MST124. The nearly-default Moodle theme I familiarised myself with last year has been reskinned with a flat theme. It’s easy on the eyes and extremely usable on mobile platforms, so thumbs up from me. (Actually, the high level of usability makes the rest of the OU site a bit embarrassing, really.) Great UX planning. MST-124 is about what I expected: A solid university course translated to an online medium. TM-129 is also about what I expected: Chaos and insanity doled out as if to children. Well, no, that’s what I expected. It seems to be more like watered down squash. It’s what you asked for, just less of it in the same sized glass. MST-124 (Essential mathematics 1) isn’t bad. It’s an obviously mature module which has honed its methods over decades. There’s just the right amount of hand-holding (to me) for things like preparing assignment formatting, progressing from unit to unit, checking knowledge, and asking for help. The ragged screams and buckets of tears from students in years past have obviously not gone unnoticed, and the result is a very logical, almost soothing trip through intermediate maths. TM-129 (Technologies in practice) is like someone had a dream about being taught the perfect module, but got it a bit wrong when they woke up and tried to write out all the details before the dream slipped away from memory. I’m sure somebody thinks it’s highly logical, but it’s really a bit weird. There are three blocks in TM-129: robotics, networking, and Linux. The only other organisation to the tutelage is by breaking it into weeks. So there aren’t units, sections, or sessions, as such. Just Robotics week 1, Robotics week 2, etc. It’s my first day with it, but it seems difficult to learn the concepts in a flowing way. Concepts appear to be explored and limited based on time, rather than a balanced or comprehensive understanding of it. Thankfully, I’m not here to get an understanding of the topics. As with TU100, I’m here to gain practice in learning. I can’t see the networking information, as that’s entirely in a Microsoft book that has yet to be shipped (I hope Microsoft Press isn’t as bad as their edX team), but I don’t see any glaring omissions from the other two topics. They’re only meant to be introductions, so it’s possible they’re as useless as OpenLearn MOOCs, or they could be dead useful. I probably won’t be able to offer much of an objective view even after the module’s over, due to my familiarity with all three topics already. Mostly I’m excited that I can study again. I enjoy the process. A four page report on concepts relating nominally to “appropriate technology” for different socioeconomic landscapes, but in reality it’s … any report ever. I’ve definitely nailed the structure, speaking to the right audience, defining my terms, and referencing. But it’s arbitrary and my confidence lacks any justifiable source. In a worst-case scenario, I could lose 10 out of 30 marks, but realistically probably 5. A 200 word snip from a job application cover letter. These are essentially free points, so I’m expecting the full 10 marks, but maybe 8. Sense activity, full 50 marks, ‘nough said. Understanding and normalising relational databases. The technical side of this I’m very confident with, so this is more about my ability to describe the process, and present information in an appropriate form (in this case some tables). I’ve defined every technical term within an inch of its life. Maybe I’ve missed something and I’ll miss 2 of the 21 marks available. A task involving understanding the Data Protection Act 1998, and security and encryption. This task is possibly the best marriage of its explicit and implicit goals, as the explicit goals mentioned are highly relevant, and the implicit goals of tailoring your message to your audience appear to be equally weighted. I’m again unduly confident here, but we’ll hedge another 2 out of 19 marks available. A page of maths and the creation of a spreadsheet, full 40 marks. Argument mapping. This one’s difficult, as there’s lots of moving parts. There’s logic, there’s reading comprehension, there’s technical detailing … It’s specifically stated that there’s no one answer, but that’s whatever the nice version of a lie is. A fib? It’s a fib. The structure and progression of the questions give the game away. The worst part is that we’re analysing what appears to be an Italian text that’s been run through Google Translate. I re-did this portion completely three times, so I’m not excessively proud of my chances. Maybe 25 out of 30 marks. Risk analysis and the data security CIA triad (mentioned briefly in a MOOC review roundup). So here’s the problem: I think this one is really about presenting information in an easy to understand format. I’ve therefore shot for the moon on this one and presented it in a non-standard but easy-to-understand format. This could backfire like a Chevy in winter. Worst case is maybe 6 out of 10 marks. On the other hand, I love the irony of taking an unnecessary risk in a task about risk analysis, so I’m not changing it. This leaves 185 marks in a worst-case scenario from 210 non-skills marks. That’s 88%. If we assume that I do similarly dismally on the 40 skills marks (which would be 35), that’s still comfortably in the distinction range. How likely is my worst case scenario? Unlikely. Realistically, I would mark it at 93-95%. So how do I feel about TU100? I don’t feel overwhelmingly like it was a waste of my time, but it’s a waste of money. That much outdated and poorly constructed material is worth maybe £500. I had a good tutor and good support from other tutors, but not really in line with the amount of money which was spent. It did, however, give me an excellent chance to practise my skills. And remind me how much I hate group tasks. It’s for the best that it’s coming to an end, and I hope they A) pull the plug on Sense, and B) stop telling people not to take Scratch courses ahead of the module if they use Scratch going forward. And studying at the Open University? It’s brilliant. It’s perfectly suited to my lifestyle. I’m glad I’m taking it slowly, as I hit quite a few personal challenges and had to keep scaling things back over and over, but I was consistently able to keep up with the work. I’m quite happy with the study prep I did, as it worked well. I know the rest will be harder than this year, but I’m really looking forward to the next short five years. Onto the greener pastures of TM129 and MST124, part-time student finance loans for the next academic year opened sometime in the last few days, so that’s sorted. Much quicker this year than last in many ways. And that brings me to … The first year of this blog being complete! And I’ve written a lot. I have no idea of what I’ll write about during the summer this year, but I’ll find something to keep me busy and learning. 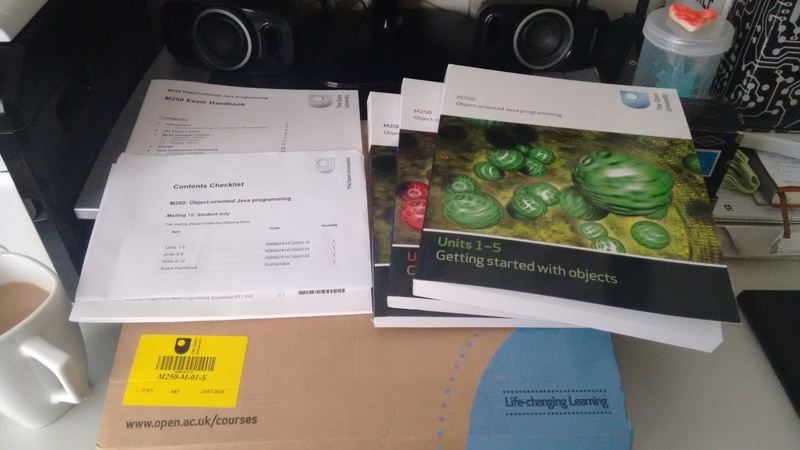 Certainly I’m going to tackle as much of maths as I can before MST124, and somehow I don’t think that OpenLearn is going to be of much help.